Files, both company and personal, can be emailed to third parties. First navigate to your Files tab. Hover over the file you wish to share and click on the green cog icon to the far right of the screen. Clicking Email will prompt a new dialog box to appear. 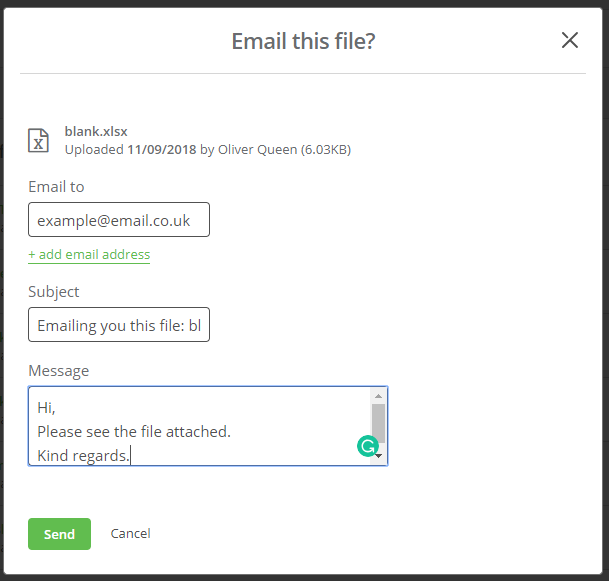 Enter the email address you wish to send the file to into the Email to field, a Subject and a Message. Additional email fields can be added using the +add email address link. When you are happy, click Send. Once you have done this, you will notice a notification appear centrally at the top of your screen confirming that the email has been sent.